An article published by Reuters earlier this week maintained that central bankers were considering dropping the LIBOR rates unless the setting of those rates can be radically reformed. Apparently, some kind of confab is going to be held in September to discuss the matter. I doubt that large financial institutions could ever be trusted to accurately report those rates, and the recent scandal adds further support to that opinion. These people are not worthy of anyone's trust. One columnist called it the "‘Lie’-bor" rate. The complaint filed by the Commodity Futures Trading Commission against Barclays provided an extraordinary amount of detailed information to show how the Libor rate settings were manipulated by financial institutions for their own financial gain. Complaint pdf; NYT I doubt that putting a bevy of regulators in their offices would cure the Masters of Disaster of their innate tendencies and general pathologies. Since I own a few floaters whose coupons are or may be tied to the 3 month LIBOR rate, I was curious what would happen when and if that rate was scrapped altogether. I have only looked at the issue preliminarily since the issue is still up in the air. I will need to do more research in the event LIBOR rates are no longer allowed to be published, which seems both unlikely and extreme to me. I only own 50 shares of this equity preferred stock which pays the greater of 4% or .67% above the 3 month libor rate on a $25 par value. United Refining reported net income of $68.1 million for its fiscal quarter ending 5/31/12. Press Release; Form 10-Q. While this is a private company, it does have one senior secured bond that matures in 2018 which is available for purchase by the public. FINRA Information I have sold my 3 bonds. SOLD 3 United Refining 10.5% Senior Secured Bonds at 104.125; Bought 2 United Refining 10.5% Senior Secured Bonds Maturing 2/28/2018 at 94.5; Bought 1 United Refining 10.5% Senior Secured Bond Maturing 2/18/2018 at 97.25 I still have it in some family member accounts and in my late father's testamentary trust. 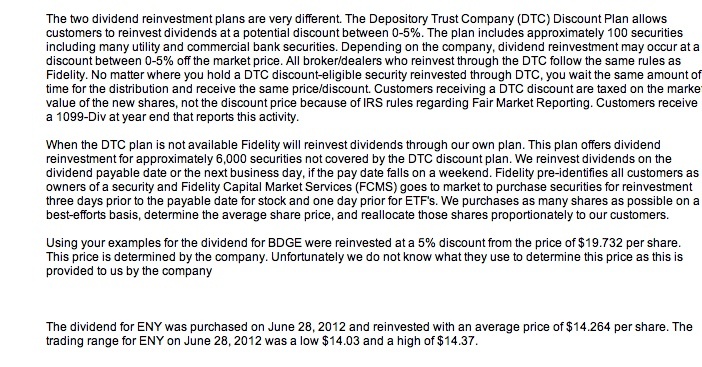 For the same dividend, I have found that there is a variance in price among brokers for reinvesting that dividend. Sometimes, the disparity is substantial and would make a material difference to an investor with a large position who reinvests the dividend over several years. I can only compare the price where I have the same security in two or more accounts and have reinvested the dividends paid by the same company. Based on my review of several accounts, I have not found a single instance where the same price was used by two firms. My sample is sufficiently large that it would be fair to conclude that the price will always vary. For some reason, this was not known to me until recently. The accounts are held at Fidelity, Vanguard, Charles Schwab and Sharebuilder. I understand what they are doing. The reinvested shares are bought at a market price placed at the open of trading on the payable date. That price could be lower, provided the price on the payable date is sufficiently lower than the price available with the DRIP plan. That price would generally be determined before the payable date. I thought that this may be the better approach, but wondered why they would be using their own funds to make the purchase before receiving the dividend payment. The opening price on the payable date may be gamed by those who know that funds are buying at that time. This may be a worthwhile subject for a study by some academic. I noted that, in most cases where I can make a comparison, the price was higher on the payment date than three days earlier. 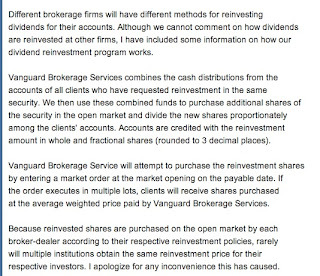 I have decided to cease reinvesting dividends, paid by exchange traded securities, in all Vanguard accounts. I will continue to reinvest dividends paid by Vanguard mutual funds. I have severely curtailed reinvestment in the Schwab account. I cut back the reinvestment option in Sharebuilder to two securities. And, I change a few options to cash at Fidelity. If anyone can make more sense of what is happening, please leave a comment or send me an email. In cases where I have been reinvesting the dividend, I will aggregate the dividend payments and then consider using those funds to make an odd lot purchase myself at an opportune time. I currently own 750+ ADX shares in my Fidelity account. I quit reinvesting the dividends. I will aggregate any future cash payments and then purchase an odd lot when the discount to net asset value exceeds 15% and the purchase price is below my total average cost per share. 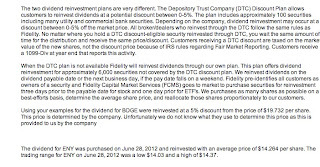 Bridge Bancorp, Inc. Reports Second Quarter 2010 Results (Nasdaq:BDGE) If the broker acquires the shares in open market transactions, then the customer will not of course receive the DRIP discount. 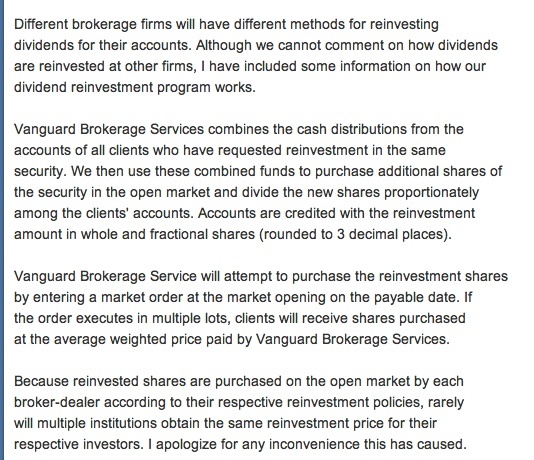 The prices from Schwab and Vanguard indicate that those firms did not enroll their customers in BDGE's DRIP plan. Prices three days before 3/23/2012 were in a range of $15.99-$16.07. GGN Historical Prices The opening price on 3/23 was $15.87. VLY opened at $10.68 on 7/2 and did not trade higher than $10.94 that day. VLY Historical Prices The price range three days earlier was between $10.23-$10.5.